Forty years ago, my father took a walk to Central Park. 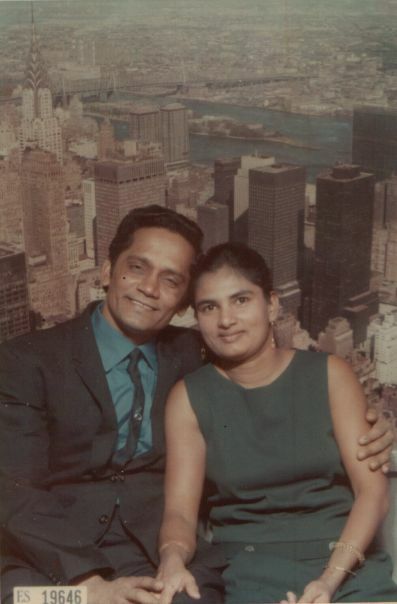 He was a day away from his 37th birthday, and had just moved his young family from an impoverished Indian rice-farming village in rural Guyana to the bitter proletariat soup of 1960s New York city, in search of America’s fabled economic and political salvation. With my mother left at home, a few blocks away in our scary little run-down apartment, to tend to me and my siblings, my father was no doubt weighted down with responsibility. It was an undeniably courageous act for he and my mother to have abandoned everything and everyone they knew in a desperate gamble to create a better future for their children. Theirs was, of course, a story told a thousand times over in that particular city. My father’s destination was Central Park because that’s where the city had set up a big television screen. Hundreds, or maybe thousands of people had convened to watch blurry, otherworldly scenes that were broadcast in black-and-white, in between bouts of loud static. In a display of a completely different kind of courage and emigration, Neil Armstrong and Buzz Aldrin were taking their first steps onto the surface of the Moon; and the world –for the first time united through a feat of science– held its collective breath in awe. This feat was witnessed by the entire waking Earth. A dream held by generations of human beings, going back millennia to the dawn of civilization itself, had finally come true. A man had touched the face of another world. Much was made of the fact that that man was American. Indeed, the moon race itself was propelled by a political race between the USA and the Soviet Union; and the Apollo moon programme was funded by unbelievable largesse from the American taxpayers. Of all the flags of the Earth, there is no denying that the Stars and Stripes deserved to be the first national symbol to rest on the lunar surface. But it’s important to keep in mind that the triumph of Apollo was a transnational achievement owned by all of humanity. The name itself, Apollo, was of Greek origin, inspired by the poetry, tales and dreams of the greatest of early Western civilizations. The theories and mathematics that formed the foundation of rocket technology were Russian, Indian, German and –depending on far back one wishes to take it– Babylonian. The rocket technology itself was the product of German engineering, admittedly the remnants of Nazi warfaring brilliance, its evil turned to peaceful, exploratory purposes. Half of the engineering staff of the Apollo programme was Canadian, refugees from Canada’s terminated Avro Arrow fighter plane programme. And tracking stations scattered in countries across the world, most notably Australia, were critical in making sure the three loneliest human beings in the universe were not lost against the infinite canvass of black space. More importantly, the moment that Armstrong’s feet touched the lunar sand, his achievement became owned by all of us, regardless of race, citizenship, age or gender, forever more. It is therefore doubly frustrating that today, four decades after this most transcendent of human technological victories, a substantial proportion of people still insist that it never happened. It seems that a kernel of self-destruction will always linger in the human spirit, insisting on turning away even the most awesome of inspirations to embrace that most insidious poison of modern society: cynicism. It must have been an important moment for my father. Like so many others in the park that day, he was a poor immigrant from a poor country, beset with worries and overwhelmed by the challenges of navigating America’s wildest city with no guide, resources, roadmap or safety net. The steps he had taken alone from the apartment, to stare up at the glowing screen, were no less significant than Armstrong’s dangerous steps from the lunar lander, to stare up at the glowing Earth. Both men had found themselves in an alien land with backbreaking responsibilities. Both had a plan for success, with a high probability of catastophic failure. And both were, in their own particular ways, profoundly alone in their travails. But both also shared a particular strength: they had each eschewed cynicism and had chosen optimism. They would both work to maximize their chances of success, mantaining the discipline and sacrifice necessary to attain their goals. They had both recognized that the price of failure was far too dear to pay. America did not provide my father with the economic salvation and opportunities he sought. So he took us to Canada shortly after that historic day. In his view, all the glories of America, the space programme among them, were mostly the domain of White people. He had oft warned me that my path might prove to be harder than my more lightly shaded friends, that some doors might always be closed to me, as they had been to him, due to nothing more than skin colour. Thus is the legacy of growing up, as he did, in a colonial nation beset with the ravages of a race-based class system. 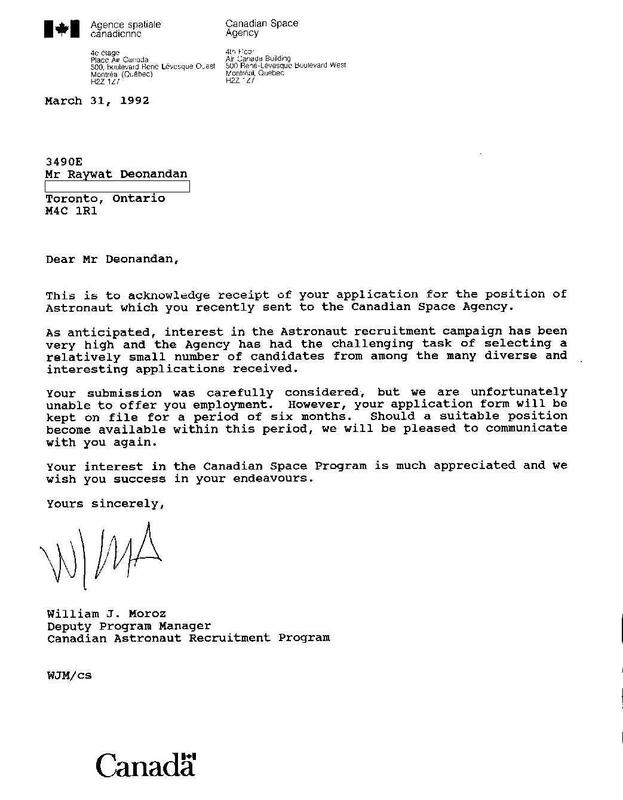 I do not think he could have ever imagined that 23 years hence, I, his youngest son would submit an application to the nascent Canadian Space Agency to become an astronaut. It was the first time that Canadian civilians could apply, and I was determined to be a part of that historic occasion. My applicaton was denied, due in part to the impressive calibre of my competition, and in part to my youth and lack of relevant experience; it was not an unexpected result. But I remember sealing the envelope before mailing it to Ottawa, overcome for a moment by a feeling of awkward profundity and historic contemplation. It had taken a mere four years in between the launch of the first artificial satellite, Sputnik, in 1957, and the successful orbiting of the first man in space, Yuri Gagarin in 1961. 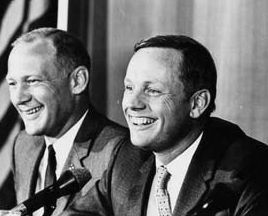 Only eight years later, Armstrong walked on the Moon. A couple of decades later, a civilian in a non-spacefaring nation –a non-white, naturalized citizen, no less– was able to apply to the space programme and be given a fair shot. In the same time span, my father had successfully made a home for his family in Canada, raising five children to successful, professional adulthood in an era well before the feel-good buzzwords of multiculturalism and global citizenship. He and my mother rest in placid retirement today in downtown Toronto, contentedly contemplating their eventual afterlives, as is the Hindu tradition, considering a completely different type of cosmic migration. We had come far indeed. In 2005, NASA announced that it has plans to return to the Moon by 2020. In 2006, Russia announced plans to mine the Moon by 2020. Some sources in China have indicated that that nation also wishes to have a lunar presence by 2020. And even India plans to have a human in space by 2014, and citizens on the lunar surface by –you guessed it– 2020. Space travel and lunar exploration as a metaphor for emigration and diaspora is not yet exhausted. As a symbol of national dominance and the supremacy of certain Western powers, it has evolved into something new. What will not change is that, for those who cast aside the easy cynicism of our times, the tendency for some humans to brave unseen dangers to open new worlds will continue to serve as an inspiration for those who seek the betterment of themselves and their families.